The labor force of an area includes people who are both employed as well as those who are seeking employment. The portion of the population participating in the labor force and the portion of the labor force that is employed are indicators of economic health. Places with vibrant economies tend to have higher labor force participation rates and, as a local economy grows, not only does the labor force often increase, but the unemployment rate typically decreases. 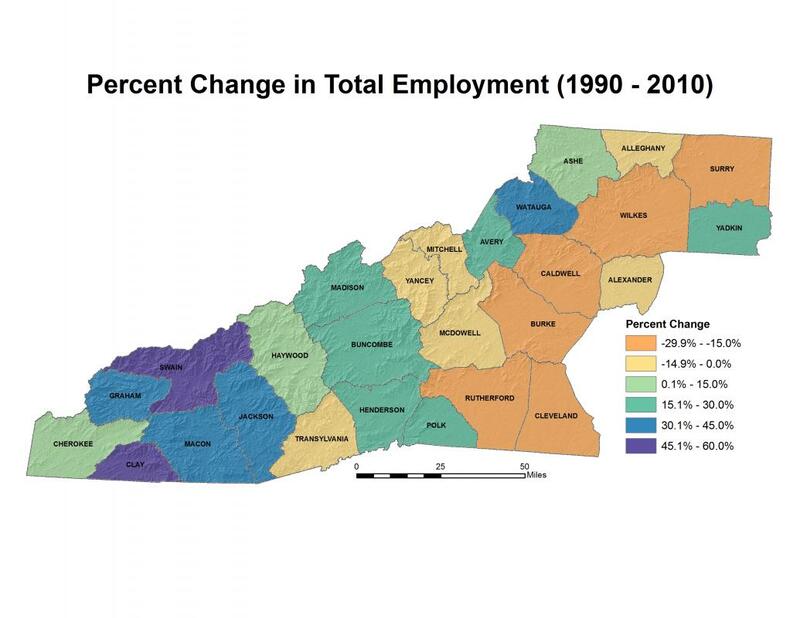 For additional current information on economic conditions in the region, visit the WNC Economic Index and Report, a monthly report that provides a timely and accurate account of economic conditions in 25 of the 27 Mountain Resources Commission (MRC) counties. The ongoing work archives key conditions and trends for the region, including how the region is performing relative to state and national outcomes. The labor force in MRC counties totaled 622,809 people in 2010 – 5,695 less than the region’s labor force in 2000. Between 1990 and 2010, the population in the MRC region grew 28 percent, although the labor force grew only 12 percent, while the state as a whole experienced population growth of about 44 percent and a 29 percent increase in the labor force over the same period. In 2010, the MRC region had a labor force participation rate of about 46 percent, compared with the state’s rate of 47.3 percent. 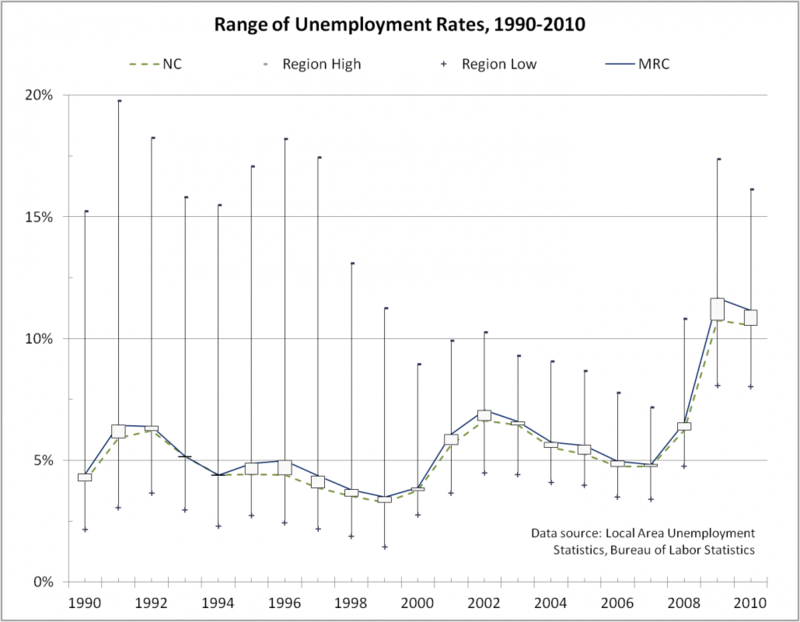 During the past 20 years, the MRC region has consistently experienced a higher unemployment rate than the state as a whole. 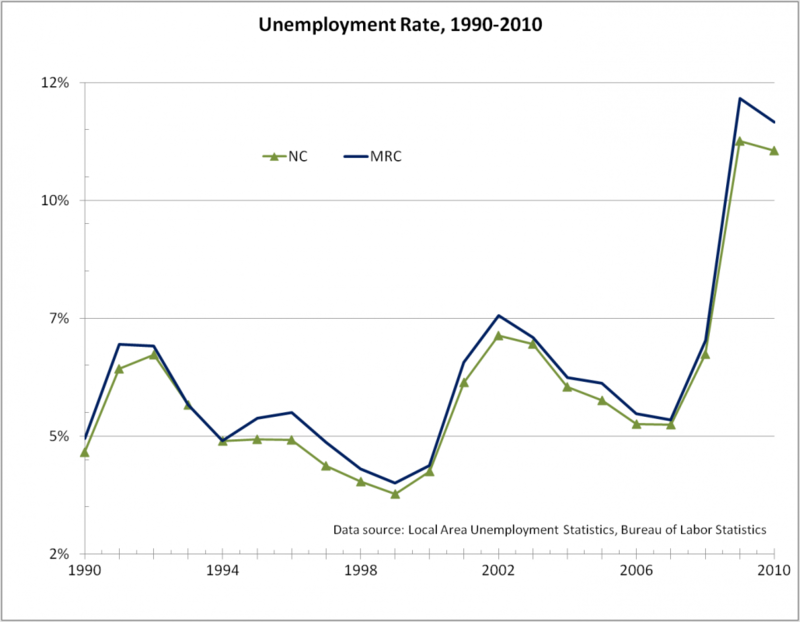 In 2010, the unemployment rate in the MRC region was 11.2 percent (compared with 10.6 percent for North Carolina) – up considerably from 4.4 percent in 1990 and 3.9 percent in 2000. 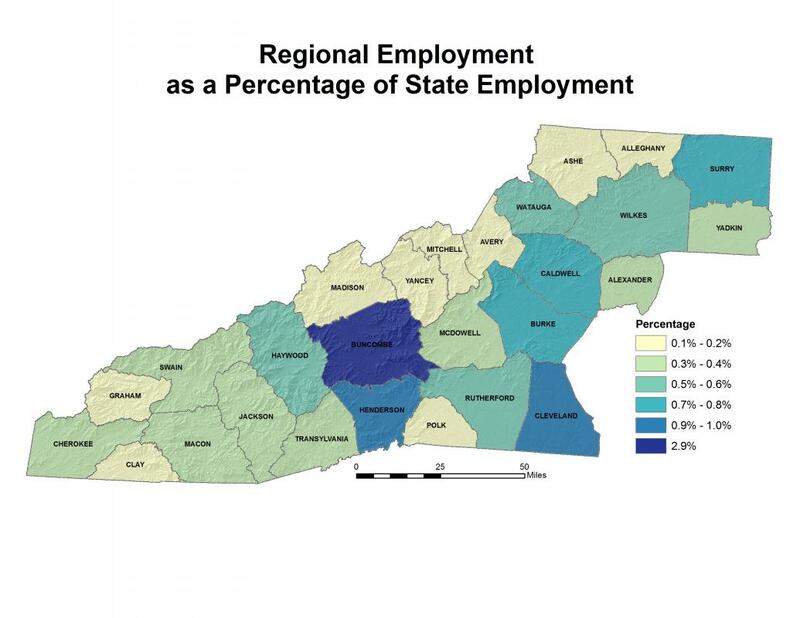 The highest unemployment rate in the MRC region during 2010 was 16.1 percent in Rutherford County, and the lowest was 8 percent in Watauga County. 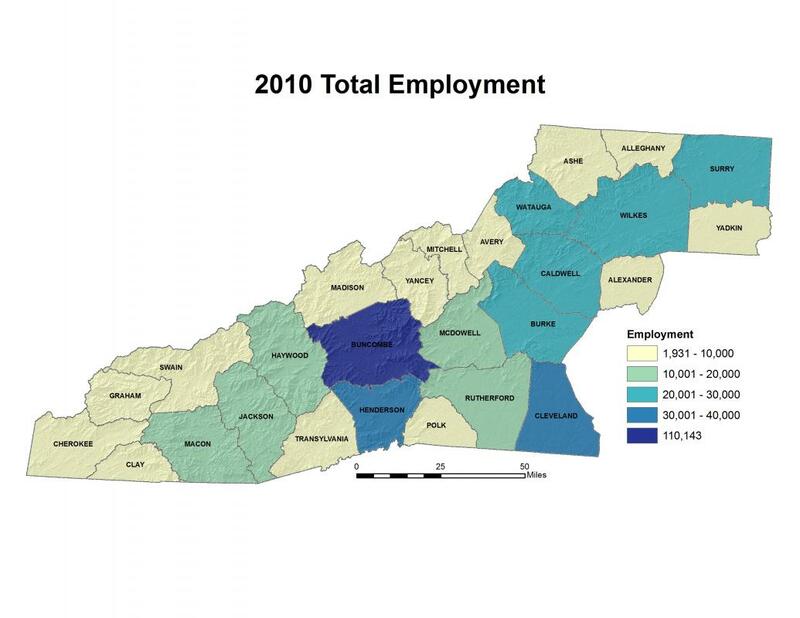 High unemployment is widespread throughout the region, as 18 of the 27 counties have a higher unemployment rate during 2010 than the state’s unemployment rate. The concept of the daytime population refers to the number of people who are present in an area during normal business hours, including workers. This is in contrast to the “resident” population present during the evening and nighttime hours. Information on the expansion or contraction experienced by different communities between nighttime and daytime populations is important for many planning purposes, including those dealing with market size, trade/service areas, transportation, disaster, and relief operations. Daytime population is a significant issue in the MRC region, but data is not yet available for a regional analysis of this topic. This information will be added as it becomes available.